Rising tides and whipping winds damaged a Jersey Shore fishing pier, flooded roads and stranded at least one driver as Hurricane Jose started churning toward the tri-state Tuesday. Brian Thompson reports. Rising tides and whipping winds damaged a Jersey Shore fishing pier, flooded roads and stranded at least one driver as Hurricane Jose started churning toward the tri-state Tuesday. In Middletown, New Jersey, police say they rescued a driver from the area of Broadway and Main Street Tuesday morning when he tried to drive through high water. His car ended up leaving the road and into a ditch, police said. When officers arrived, they found the driver sitting on the roof of his car. He waded through the water to police, who transported him from the scene. Manasquan officials also said some streets had minor flooding from the morning's high tide. 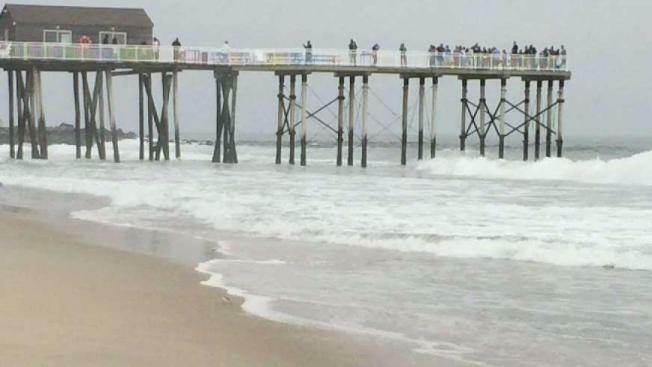 In Belmar, high waves lashed at the shore so fiercely they damaged a fishing pier that had been restored from Sandy damage in a half-million dollar project. Belmar Mayor Matthew Doherty says a support beam has detached and pilings were knocked loose in the morning waves. Police in communities along the shore said the storm was causing dangerous conditions in the water and reminded people not to go in. People in Montauk weren't too concerned, though. Sue Kravarik watched the pounding surf from the deck of her home, and she and her neighbors have tied down their outdoor furniture and umbrellas -- but they're used to wind gusts and will keep an eye on the storm. Hurricane Jose is expected to stay out to sea but will still deliver punishing rains, rough surf, wind and beach erosion to the tri-state area. A tropical storm watch is in effect for the coast of Long Island from Fire Island inlet to Port Jefferson, and from New Haven, Connecticut, to Watch Hill, Rhode Island. According to the National Hurricane's latest advisory, Jose is expected to make a turn to the northeast Tuesday night, when it will begin dumping up to 3 inches of rain on eastern Long Island and southeast Connecticut.